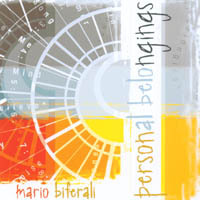 Mario Biferali - like many guitarists everywhere began playing guitar in local rock bands, eventually Mario started touring the country and releasing CDs with his rock band Krystal. His earlier studies in classical guitar both at the D’Arcy McGee Fine Arts Center - where he attended high school - and later at Vanier College were a big influence on him. However the strict manner in which Classical guitar was taught was sometimes overwhelming for Mario. He would often get reprimanded from his teachers after a solo performance, as Mario would occasionally “disrespect” tradition by adding a pull-off or blues style vibrato to a classical piece. Still, Mario continued playing nylon string guitar and eventually started writing songs that would allow him to blend classical and Jazz guitar, Latin rhythms, new age sensibility and pop melodies. Obviously this is not new, however since Mario comes from a rock/blues background his music seems to have a little extra “edge” in the otherwise smooth genre of music. After 12 years Krystal disbanded in 2000 and Mario decided it was finally time to follow through on a promise he made to himself years ago: to record an uplifting, good-natured easy listening CD. The goal was to donate $1.00 from every CD sale to Cancer Research. His inspiration was his Mom who passed away from Cancer when Mario was just 13 years old. The result is “Personal Belongings”. The response from music fans was great and the word of mouth, outstanding. In addition, Mario received airplay and support from Galaxie.ca/CBC, CBC Radio across Canada as well as CKUT McGill Radio and CFMB Montreal. Fast-forward to 2009, Mario Biferali, is now married with three kids. Like many dads, he’s found himself at the Children’s at all hours of the night sitting there with his kids as volunteers, doctors and nurses do the best they can to comfort both parents and kids. “I remember one night, as my daughter was getting a Ventalin treatment for her asthma, thinking to myself, here we are, in this very nice room, receiving world class care, by the best staff in the world, we shouldn’t take this for granted”. That night, Mario’s idea was born. Remembering how his sister’s advice “You don’t have to be a famous rock star to make a difference” inspired him to release his first CD Mario decided it was time to “Up” the challenge and create OneMillionDownloadsForCharity.com and challenge the world to Download & Donate! Mario Biferali is happily married with 3 young children. He is enjoying his career in the Musical Instrument industry as the Sales & Marketing Manager for Montreal based guitar manufacturer Godin Guitars and although he doesn’t get to perform live as much anymore, Mario’s music has been used in video games and toys such as International World Of Toy’s “Lullaby Pillows” and “Talking Crayons”. His music was also featured on the CD “Twas the Night for Smooth Jazz” as well several compilation CDs which were distributed in Canada and/or the USA.